At the end of each choir season, Tina Filippino brings her three choirs together for a Big Sing. These are wonderful events where singers from the neighboring communities of Quadra Island, Black Creek and Comox come together to sing their common repertoire, building community through song. Each singer contributes $10, and after direct event expenses are paid, the remainder is sent to The Ubuntu Choirs Network, and from there, to Mozambique. The first amount went to fund two teachers for a year in the traditional music program in Kapasseni Village School. 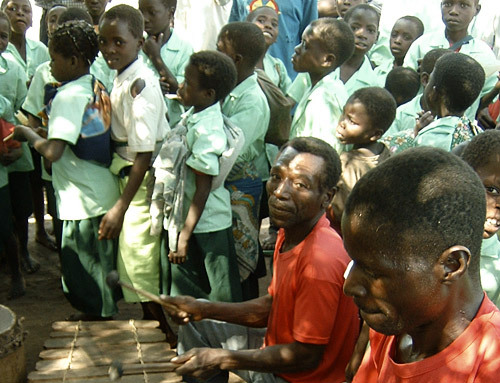 A second amount went to purchase musical instruments, as well as band and choir t-shirts, for AIDS orphans in Caia, Mozambique. Both these gifts have brought immense joy to the children. I fondly refer to the Letz Sing choir as my ‘weekly therapy session’. In these very stressful times, Tina reminds us that “a song is somewhere to begin”. As a result, I leave choir feeling inspired; humming and singing to myself and in turn, spreading that positive energy to anyone else that I come in contact with.